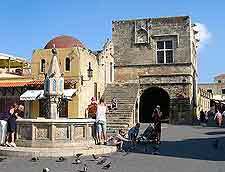 Within Rhodes Town, the Kollakio (Knights' Quarter) of the Old Town is where the majority of the most impressive medieval landmarks and sights reside. 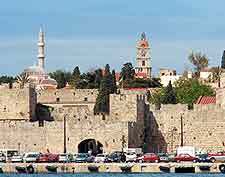 The fortifications and medieval city walls make the Old Town a particularly characterful part of Rhodes, contrasting greatly with the lively beach scene close by. Over the centuries, the island has been home to some extraordinary landmarks, such as the ancient harbour statue entitled the Colossus of Rhodes, which vanished without trace following as earthquake in the 3rd century BC. 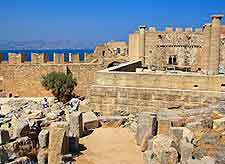 Today, the most impressive monuments to the past include the Palace of Villiers de l'sle Adam, the Temple of Aphrodite, the Acropolis, Kritinia Castle, the Castle of Monolithos, and Mandraki Harbour itself. 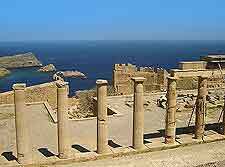 The New Town area of Rhodes Town offers its own set of historical monuments, offering visitors a taste of the this ancient Hellenistic city. 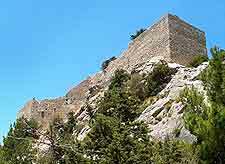 One of its most famous of the landmarks is the Acropolis of Rhodes, which lies directly to the south-west of the Old Town and on the one the hill known as the Monte Smith, where Admiral Sydney Smith once watched the fleet of Napoleon at the start of the 19th century. The Acropolis dates from the 2nd century and this restored stadium was once home to enormous sporting events, as athletes prepared for the Olympics. Also of interest is the adjacent Temple of Pythian Apollo, and on the northern side of Mandraki Harbour, the Mosque of Mural Rels. 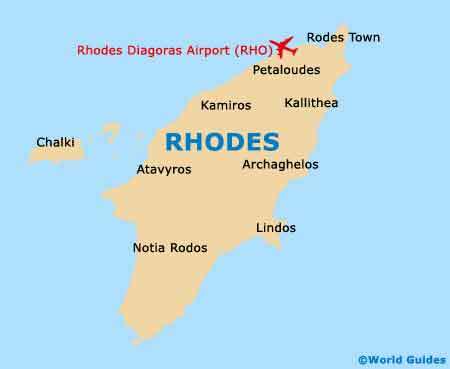 The Old Town area of Rhodes Town is full of character and contains some very impressive sights. Split into the districts of the Knights' Quarter (Kollakio), the Jewish Quarter and the Hora (Turkish Quarter), it is the Old Town's Kollakio where the majority of medieval landmarks reside. The Old Town can be reached by nine main gateways, known locally as 'pyles', and its buildings offer a pleasant mixture of Byzantine, Latin and also Turkish styles, punctuated by a series of public squares. Within the Kollakio district, look ut for the Avenue of the Knights and its 600-metre / 984-foot fortified wall. As you walk along the Avenue of the Knights you will encounter landmarks such as the 1519 Inn of the Order of the Tongue of Italy, and the neighbouring Palace of Villiers de l'sle Adam. Also in Old Town Rhodes, look out for the Chapelle Française (Chapel of the Tongue of France), and the truly magnificent Palace of the Grand Masters, which although dating from the 14th century, was rebuilt after being destroyed in 1856 by a gunpowder explosion. 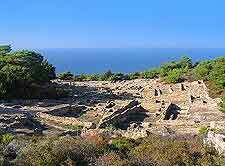 Situated on the Plateia Symis, the remains of the Temple of Aphrodite from the 3rd century BC may also be of interest. Kritinia Castle is a popular Venetian structure lying close to both the Kamiros attraction and the village of Kritinia. The landmark itself enjoys an elevated setting and dominates the entire area from its 130-metre / 427-foot hill. Easy to reach and featuring its very own car park, Kritinia Castle is a rather romantic and magical spot to come at the end of the day and watch the sun go down. The castle's remains are in a reasonable state of repair, with imposing walls the former look out post boasts stunning panoramas of the nearby islands. 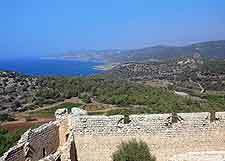 Those staying on the eastern coast of Rhodes should consider paying the ruined Castle of Monolithos a visit. Located in Monolithos and on the northern side of the village of Gennadi, this Venetian landmark stands high above the surrounding landscape, being perched atop a 240-metre / 787-foot rock, some 10 km / 6 miles to the south-east of Apolakkia. The Castle of Monolithos can be reach via a narrow pathway and stands alongside St. Panteleimon's Church, which features contrasting gleaming white architecture and a small domed roof. Whilst the castle remains are very interest and the setting quite dramatic, the views across the western coast are worth the effort alone. The pebbly beach of Fourni is close by. One of the oldest archaeological landmarks on Rhodes, the ancient ruins of Kamiros date back as far as the 7th century BC. Coming here is quite a humbling experience, particularly when you start to imagine the civilisation that once lived here more than 2,500 years ago, even using their own coins. Excavations of Kamiros commenced in the 1930s and soon revealed an ancient city lost in time.